Of all the Lexus hybrids in 2013, the Lexus ES 300h was able to be the most efficient and luxurious at the same time. During the test, the vehicle obtained an average of 45 mpg and at once even got well over 50 mpg. This hybrid was a pleasure drive while not compromising on being an efficient car at the same time showing Lexus certainly has improved on its efficiency. While this hybrid had a powerful 2.5-liter four-cylinder Atkinson cycle engine, the Lexus ES 300h test driven was to get a fuel economy of 40 mpg combined. With all the green lighting using LED bulbs, it seems reasonable to assume an efficient use of gas since LED lighting are more efficient than any other type of lighting. The test drive was expected to earn an EPA fuel economy rating of approximately 40 mpg city, 39 mpg highway and 40 mpg combined. The ES 300h generates 200 total system horsepower and I did get about an average 45 mpg; at once I even got 53 mpg. That’s how the Green Living Guy does his test drives! However, I did wish it could go more than 50 mpg, so aybe future models can get there. Hint: there was more than enough trunk space to add more batteries. The Lexus 300h Hybrid Electric car was very efficient for its size. It has a 2.5-liter four-cylinder Atkinson cycle engine. 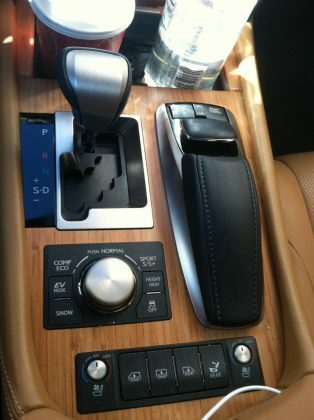 The Lexus ES 300h featured a Drive Mode selector for Eco, normal and sport. The vehicle changes from the hybrid power monitor to a tachometer. The ES 300h adds an EV mode which allows short distance drives, at reduced speed, using only the power from the hybrid battery pack. The ES featured enhanced NuLuxe seating surfaces, developed to help reduce environmental impact. Trim colors and materials include Piano Black, Espresso Bird’s-eye Maple, plus Bamboo for the ES 300h. The ES bears the new face of Lexus with its distinctive, spindle grille (The “L” design motif) is reflected in the LED daytime running lights and combination rear lamps. These totally help with MPG because they are more energy efficient than regular lamps. The ES 300h features an exclusive rear design with hidden exhaust and an integrated rear spoiler. Other details specific to the hybrid include unique blue badging and exclusive 17-inch alloy wheels. Another cool feature on the car I tested was the standard and available safety features aiding the driver. For example, the optional Blind Spot Monitor with Rear Cross Traffic Alert (RCTA) helps detect vehicles in side blind spots. Available Lane Departure Alert, Pre-Collision System (PCS) uses sub-millimeter wave radar, designed to detect certain obstructions traveling ahead and prepare the vehicle for a potential collision. Here are more pictures of the car but expect luxury, efficiency and style. Just waiting for future models to test and see how they improve.